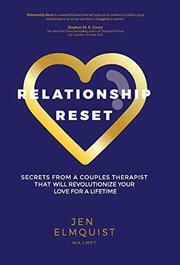 A couples therapist offers a comprehensive guide to maintaining healthy, intimate relationships. In her nonfiction debut, Elmquist acknowledges at the outset that the “stressors” working on any committed relationship are many, varied, and serious: “Financial obligations and work priorities, life responsibilities and accountabilities, and the daily needs of family and friends [are] all asking for your attention while you and your partner attempt to maintain individual and collective hopes and dreams.” At the heart of her advice is the concept of a “reset,” during which couples are urged to step back and look holistically at the changing nature of their relationship. Elmquist relates the familiar and worrying statistic that most troubled couples wait a very long time—the average is around six years—before seeking out professional therapy. She aims to drastically shorten that interval by equipping couples with the tools they need in order to detect and address problems as they arise. The key is something that Elmquist calls the “Six-Stage Change Cycle of Committed Couple Relationships,” which aims to help couples identify the various evolving stages of their relationship: “You and Me,” “We,” “I and I,” “The We/I Plateau,” “The D-Factor” (involving differentiating one’s personal identity), and “Us or Me.” The author effectively points out that these stages are fluid things, taking different forms with different partners, but she notes that they are nevertheless universal: “We all play each of these roles at one point or another in our relationships,” she writes. “To deny that is to deny we breathe.” Overall, the book’s near-total lack of platitudes and magic bullets is very refreshing. Through the use of ample case studies of her own clients to illustrate her points, Elmquist makes her step-by-step breakdowns immediately applicable to her readers. She also employs a uniform tone of enthusiastic encouragement throughout (“Getting started is the key. Momentum follows action!”), lightening her prescription of hard, detailed work that every committed relationship requires. An impassioned and analytic guide to taking control of faltering relationships before they fall apart.